Insulin stimulates proliferation of thyroid cells in culture. 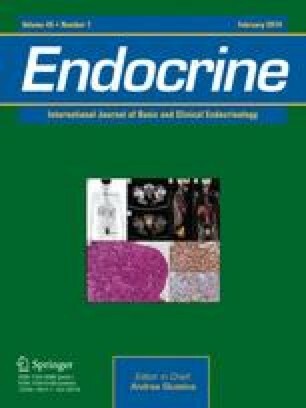 The presence of insulin resistance (IR) is associated with larger thyroid gland volume and an increased prevalence of thyroid nodules. The aim of this study was to investigate the presence of any possible association between IR and thyroid cancer. Forty-one patients with diffuse thyroid cancer (Group 1) were matched for age and gender with 41 patients with nodular goiter (Group 2). Both groups were compared in terms of frequency of IR, as estimated by the homeostasis model assessment, as well as other parameters of the metabolic syndrome (MetS). Fourteen patients (34.1 %) in each group had MetS. Twelve patients (29.3 %) in group 1 had IR compared to 10 (24.4 %) in group 2. Mean HOMA-IR scores in group 1 and 2 were 2.5 ± 2.2 and 1.8 ± 1.1, respectively. Thirty-two patients (78 %) in group 1 had a body mass index (BMI) of more than 25 compared to 33 patients (80.5 %) in group 2. The difference between groups with regard to HOMA-IR, the frequency of IR, BMI, and any of the parameters of MetS was statistically insignificant (p > 0.05). A subgroup analysis based on tumor size did not reveal a significant difference between patients with microcarcinoma (≤10 mm) and macrocarcinoma (>10 mm) in terms of any of the study parameters (p > 0.05). Neither MetS nor IR was a significant risk factor for thyroid cancer following logistic regression analysis (p > 0.05). IR is not more prevalent in patients with thyroid cancer. Some other pathologic mechanisms may be more prominent during thyroid carcinogenesis. The authors declare that there is no conflict of interest and the study complies with the current laws of their country.